It’s New Year’s Eve and we’re out exploring eastern North Carolina. I hope to be able to share some magnificent pictures tomorrow. Or not! We’ll see. I selected this creative commons licensed photo because it is a miraculous photograph. But also because there was this look of expectation on the child’s face, that nourishing water will soon be flowing from that spigot. I guess that it is somehow appropriate to share some reflections on the previous year today — and wishes for the next year tomorrow. That part I’ve been working on already. But this morning, it’s simple. This has certainly been an important year for information. The new web has continued to evolve and to give us lots of new ways to access, think about, rework, and communicate information. What’s more, more people are talking about it. It could be that the sensationalism, through which blogging was presented by the media, got these tools out there with such bluster, that the backlash toward realizing them as a tool for teaching and learning may be more effective than would have otherwise been possible. I don’t know. I tend toward the positive spin, often naively. At any rate, I see a momentum building with regard to teachers and schools wanting to experiment with these new information applications. But I see another momentum building that I think is even more important. There seems to be a new spirit of re-visioning going on. For the first time in years, people are beginning to think about teaching and learning as something that might be done differently and better, rather than something that is simply done with more force. I’ve seen this in my own state with its work toward Future-Ready Students and the broader and increasing interest in the work of the Partnership for 21st Century Skills. I think that my own message about contemporary literacy has fallen on more fertile ears lately because of this sense of re-visioning. As much as people have gotten tired of the mantra, I suspect that The World is Flat has had a lot to do with these changes. Many new ideas have found avenue for expression, but largely because Tom Friedman has given us a new way of thinking about a world that is rapidly changing. I suspect that the next few months and years will be an interesting and invigorating time to be in education. Smith, Gregory. “The Fountain of Youth….” Carf’s Photostream. 4 Nov 2006. 31 Dec 2006 <http://flickr.com/photos/beija-flor/288487084/>. I really wasn’t aware of this going on until Andy Carvin tagged me last night at 6:27. It seems that folks are blogging five things that their readers don’t know about them, and then tagging other people to fess up. How can I top getting shot at by Turkish military police, or knowing Taekwondo, or being a concertmaster in an all-state high school orchestra? Well here goes, and this is probably going to be corny! OK, I changed a couple of them, feeling that I got a bit to personal. So one and 3 are different! On of my ancestors, on my mother’s side was a lady in waiting for Queen Elizabeth I. She is buried in Westminster Abby. My Aunt Janet has seen her tomb. The first professional development that I ever performed was a lesson on how to roll up an extension cord for a 16 mm projector. I was once in a community play. I played the ghost of Jacob Marley in Scrooge. It was great fun. I also ran the lights in Godspell. When I was in high school, I made date money playing in various rock and beach music bands. I also played guitar in coffee houses when I was in college, but I didn’t make much money. I don’t sing very well. That’s true! Andy Carvin writes a fine summary for the Deleting Online Predators Act at Learning Now. But the final nail in DOPAâ€™s coffin came with the switch of Congress from Republican to Democrat. Legislation that doesnâ€™t get signed into law by the end of a congressional term has to start from scratch during the next term. In January, the Democrats will be in charge of both houses of Congress, and thereâ€™s no sign that theyâ€™re going to rush and re-introduce DOPA. Key DOPA critics in the House and Senate, including Reps Ed Markey, John Dingell and Sen. Patrick Leahy, will soon be in leadership positions. With the Republican losses in November, it will be harder for their caucus members to re-introduce DOPA, especially since Fitzpatrick is gone and they lacked Democrat co-sponsors in the first place. Geek Index is pretty high on this one! You know how frustrating it is when you want to respond to somebody’s blog posting with your well thoughtout disertation, but the scrolling text box is only 14 columns by 2 rows? Well The Man in Blue, Austrialian web designer, Cameron Adams, just showed me a way around that problem in FormTextResizer: Bookmarket for resizing textarea and text fields. Just right-click on the link at the very bottom of this post, and save it as a bookmarklet, preferably in your links bar at the top of your browser. Now, when you encounter one of this impossibly small textarea boxes, just click your resizing bookmarklet, and then slide your pointer over the text box and then to the end or lower right hand corner of a text box. You will be able to make single line textboxes longer or shorter, and stretch or shrink scrolling textboxes. I adapted the link into my comment.php file in the Theme folder for my WordPress installation to create a Click to resize the Textbox link beneath the comments text box for my blog. Comment on this blog and try it out. Adams, Cameron. “FormTextResizer: Bookmarklet for Resizing Textareas and Text Fields.” [Weblog The Man in Blue] 25 Aug 2006. 29 Dec 2006 <http://www.themaninblue.com/writing/perspective/2006/08/25/>. Might North Carolina Dance into the 21st Century? I wrote yesterday (North Carolina Aims for the 21st Century) about my state’s Future-Ready Students for the 21st Century goals, commenting on some aspects of the learning and teaching elements. As the day progressed, I found myself thinking more about the process. As a thirty-year educator, I have seen many such initiatives in North Carolina, most of which I can’t even remember the names of, even though they were, in their times, household terms. One thing that they all had in common was that they were top-driven. In most cases they came from the legislature, through the State Department of Public Instruction (DPI), into our regional service centers (before the legislature ended them), into district central offices, and then to the classrooms — where resources were provided and state professional development was delivered. It was really the only way.. The entire information landscape has dramatically changed in the last few years, an idea that many of the Future-Ready Students‘ goals certainly reflect. However, is there an opportunity here to make the entire state education system future-ready. Rather than handing the plan down to the future, we might, in today’s new information environment, dance together into the future. Rather than reshaping schools as a sermon, reshape them as a conversation, among communities and professional educators at all levels. Open it up by making read/write web applications available to educators and communities with professional development. I know of two distance learning programs at DPI that could probably put together very effective learning modules for blogging, wikis, etc. fairly quickly and easily. Put it out there and open it up. Work at the district level to acquaint leadership with the tools of broad conversation and ask them to identify key school, classroom, and community leaders and extend direct invitations to them to engage in this conversation. What will the future-ready school look like? How do we assess future-ready skills? What do future-ready professional educators look like and how do we achieve that? What conditions support 21st century teaching and learning? Do we have the necessary support systems? Each issue, question, and vision area would have its own meta tag. This document could easily be turned into a content aggregator where all of the teacher, administrator, and community statements (blogs, podcasts, and wiki pages) would automatically be referenced within the document creating a growing, dynamic, living resource, an ever adapting plan for schools that continue to prepare children for THEIR future. Runs with Scissors, “1997.” Runs With Scissors’ Photostream. 20 June 2006. 29 Dec 2006 <http://flickr.com/photos/kenstein/171621683/>. Author David WarlickPosted on December 29, 2006 Categories education1 Comment on Might North Carolina Dance into the 21st Century? I’ve known about this for a few months, but only took a close look the other day after a meeting with some folks at our state department of education (NCDPI). It’s called, Future-Ready Students for the 21st Century, and this list of goals for North Carolina schools is, in my opinion, a much needed about-face for those who go5vern education in my state. If you’ve been reading my blog for a while, you know that I deeply respect the professional staff at our department of ed. That anything good comes out of any state political agency attests to the intelligence, professionalism, and persistent drive of people who work there. I spent six years with NCDPI, and simply didn’t have the strength of character to keep working there, when there always seemed to be to many political reasons not do do good. I want to share the enormous and often demoralizing constraints that face people who work for state and federal departments of ed — as a preamble to the comments I am making about this document. It is also important for you to know that North Carolina was, to my knowledge, the first state to embrace school accountability. It was 1995, the year I left the agency. I would tell you my recollection of those days, but it would make you want to sit down and cry. So, Goal one… NC public schools will produce globally competitive students. Well there’s that ‘C’ word again. Why can’t we recognize that globalization is not happening because countries are competing with each other, but because we are cooperating. The sub goals are… Every student excels in rigorous and relevant core curriculum that reflects what students need to know and demonstrate in a global 21st Century environment, including a mastery of languages, an appreciation of the arts, and competencies in the use of technology. I’m encouraged by inclusion of the arts in the first statement of the first goal. Making and appreciation of the arts such a prominent part of our schooling won’t be so easy — but it could be enormously fun. I was also pleased to see inclusion of technology, though we’ve been testing 8th graders on their technology competencies for almost ten years, and it hasn’t gotten us any closer to the 21st century — in my opinion. Every studentâ€™s achievement is measured with an assessment system that informs instruction and evaluates knowledge, skills, performance, and dispositions needed in the 21st Century. This sounds to me like we move assessment back into the classrooms, and away from the state legislature. I’m sure I’m missing something though. I shouldn’t be so glib, but I believe that teachers are prepared, equipped, and the best people to be assessing student learning. That some teachers are not prepared should not be solved by institutionalizing assessment. Alright, so what does this look like? I just deleted a bunch of my text, realizing I was becoming a bit negative, and that is not what I want to do here. So I’ll hold my tongue for a bit. Woe! My eyes just popped out. We are not talking about learning technology skills, but USING technology and information skills to become self-teachers. I could see this becoming the central hub of what is happening in schools to help students to become future-ready. Convenient access to ICT for every teacher and student (and I’m not talking hand-helds). Degree or college transfer credit. A lot of high schools are looking at partnerships with local community colleges as a way to add significant learning opportunities for students, and to align opportunities to local needs. I think that this is a good thing, though I suspect that we are just scratching the surface for finding ways to efficiently provide addition non-traditional learning opportunities for our students. The next major goal is… NC public schools will be led by 21st Century professionals. Sub goal one … Every teacher will have the skills to deliver 21st Century content in a 21st Century context with 21st Century tools and technology that guarantees student learning. Again, my eyes are bugging out with excitement. But what kind of crowbar are you going to use to pry loose teachers and administrators who are so cemented into the motions of school as usual? Mere professional development will be so utterly insufficient to this task that I would prefer that the term not even be used in this conversation. Past that, I think that the opportunities for making teachers and administrators 21st century professionals are so exciting and so compelling, that ripples might extend into our universities and draw more bright and ambitious students into schools of education. This kind of school is a place where people will want to be — teacher and learner. Every teacher and administrator will use a 21st Century assessment system to inform instruction and measure 21st Century knowledge, skills, performance, and dispositions. This is almost too obvious to be mentioned, though I understand why it is. but the new assessment must be much more than technological. It must be cultural. Every education professional will receive preparation in the interconnectedness of the world with knowledge and skills, including language study. I think that this is absolutely essential as long as we are not asking teachers to take Spanish or Chinese. Adults do not learn foreign languages the way that children do. That said, I think that there is much that we can do to fully globalize our curriculum and to make interconnected another word for the classroom. Every education professional will have 21st Century preparation and access to ongoing high quality professional development aligned with State Board of Education priorities. OK, this is another one that had to be said. But we need to completely redefine professional development. it needs to be much more casual, ubiquitous, tied as much to the everyday needs of teachers as to SBE priorities. I’d say, also, that the State Board of Education probably needs a healthy, casual, ongoing, and intense dose of PD to keep up with the world we are preparing our children for..
Every educational professional uses data to inform decisions. This is implied in so much that has already been said and too obvious to be mentioned explicitly. Yet, I understand why it is. State assessment has not done much to inform teachers with data. It needs to happen, and perhaps it needs to be said for that reason. There are three more goals, that I will address in a future blog. NC public schools will be governed and supported by 21st Century systems. MPD, “Legislate This!.” MPD’s Photostream. 22 Jan 2006. 28 Dec 2006 <http://flickr.com/photos/mpdehaan/89937175/>. Fred Koch alerted me to another story about video games in education. This Chicago Tribune piece is about David Williamson Shaffer, of Epistemic Games and the Department of Educational Psychology at the University of Wisconsin-Madison. There’s not a lot that is new in the article, but we have another serious researcher to pay attention to. For the past 10 years, Shaffer has been creating and researching the effects of computer games that immerse kids in virtual worlds that require them to solve real-world problems of specific professions. The key is “using computer games to prepare children for a life of innovation and creativity rather than giving them standardized skills for life in the factory,” he said. Specifically, Shaffer’s games immerse young players into the worlds of doctors, lawyers, engineers, journalists and others. I’m just happy that people who are talking about retooling education are finally being paid attention to. I decided to come back to this before posting it. The article mentions research, but the findings seem to be purely anecdotal. Unfortunately, we have been biased toward scientific research, and people are not going to take this seriously until there is quantitative data available, but what would that look like? Can you test, in a researchie sort of way, the skills that are developed in video games? Can you test the skills that are developed in on-the-job training, and a quantitative way? In a real sense, that’s the type of learning that happens while playing video games? Goldfayn, Alex L.. “Video Games that Teach Beyond Basics.” Chicago Tribune 25 Dec 2006 27 Dec 2006 <http://www.chicagotribune.com/business/ chi-0612250068dec25,0,5964628.story?coll=chi-business-hed>. ES, “The Video Game Booth.” ES.’s Photostream. 24 Sep 2005. 27 Dec 2006 <http://flickr.com/photos/electrospray/46118353/>. Microsoft’s Dan’l Lewin posts in his AlwaysOn blog, a rather long piece on what’s next in video games. It is largely a Microsoft commercial, but uncovers some of the emerging trends in the video game industry. Gaming is clearly one of the trend stories of the decade. It is making an impact on our lives no matter where we are â€” in our living rooms in front of the TV, on our cell phones, working at our PC, and coming to a portable media player near you. The next level of gaming is here, and it is being driven by three converging trends: high-definition gaming; on-demand, online gaming; and social entertainment. So hold on, and get ready for a screaming fast, gaming experience. One part that intrigued me was they way that gaming will cross platforms as..
A gamer starts a connected game on her Xbox at home, continues it on the cell phone in the cab on the way to the airport, and finishes it up on the plane by plugging into the armrest. Imagine a day where student work (instructional play) starts a school on the laptop or on an interactive video wall, continues on the students cell phone (pocket information appliance), and includes work on the family’s TV (home entertainment system). Perhaps even the microwave can play a part? Well, I just don’t know, but it’s clear to me that it’s in our devices, that the information will be — and recognizing and adapting to this trend is crucial to educating today’s children for their future. Katy, Toxic. 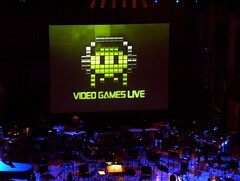 “Video Games Live.” Toxickaty’s Phostream. 15 Aug 2006. 26 Dec 2006 <http://flickr.com/photos/toxickaty/216059264/>. ..that the first 50,000 teachers who request the movie for use in their classrooms would be given DVD copies, on a first-come, first-served basis. The EdWeek story includes some intrigue where the National Science Teachers Association (NSTA) was offered the film to distribute to its 56,000 members, and the association turned them down. Supporters of the film..
..questioned whether the NSTA’s stance was based on its having received funding from oil interests, including the foundations of the ExxonMobil Corp. and the Conoco Phillips Co. So what do you think? Have you seen the film? Do you think that school children should be shown the film in class? You can click to the article below, but you will be required to register with edweek.org and readers who have not subscribed to the print version are only allowed to visit two articles a week. 1Bracey, Bonnie. “Producer of Goreâ€™s Film to Distribute Free Copies to Teachers Via Web Site.” E-mail to David Warlick.22 Dec 2006. 2 Cavanagh, Sean. “Producer of Gore.” edweek.org 21 Dec 2006 25 Dec 2006 <http://www.edweek.org/ew/articles/…>. Image: Blanco, Sonia. 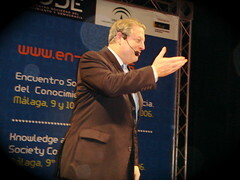 “en-CODE:Al Gore.” Sonia Blanco’s Photostream. 10 Oct 2006. 26 Dec 2006 <http://flickr.com/photos/sblanco/266189237/>. Google Inc. has released a new version of its Blogger service, adding privacy settings that restrict readership to a predetermined audience. Users can choose to have blogs accessible to anyone or just to themselves. Or they can list the e-mail addresses of the people they want to let in. Those readers would need to register for a free Google (nasdaq: GOOG – news – people ) account – the same used for its Gmail and other services – and would sign in with their regular Google passwords. Might this development make Blogger more attractive to schools?